The Easter break provided a good opportunity to catch up on some recent climate stories, but the current messages delivered by the various media and other outlets vary enormously with a bewildering array of assertions and counter claims. The continued arguments about the “pause” or otherwise in global warming continue, most notably in the Mail Online / Mail on Sunday, where columnist David Rose argues that there is “hard proof” that incorrect global warming forecasts are “costing us billions”. But his arguments have a number of problems. But I also explained that doubling pre-industrial carbon dioxide concentrations, which we are almost certain to do now, was just the beginning. Increasing use of fossil carbon at the current rate would drive atmospheric concentrations towards four times pre-industrial figures by 2100. So even if the “climate sensitivity” is as low as 2C, as some lines of evidence now suggest, we would still be looking at 4C plus by the early 22nd century. 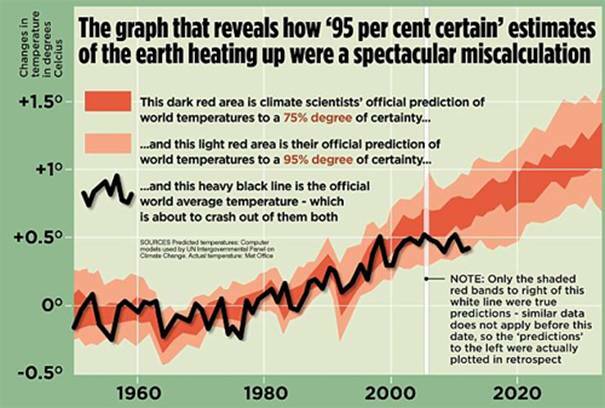 The Mail article uses a simple surface temperature chart to argue that warming estimates have been a “spectacular miscalculation”, even though the heavy black line shown in the chart (see below) has not actually breached the 95% confidence limits, rather there is just the assertion that it “is about to crash out”. 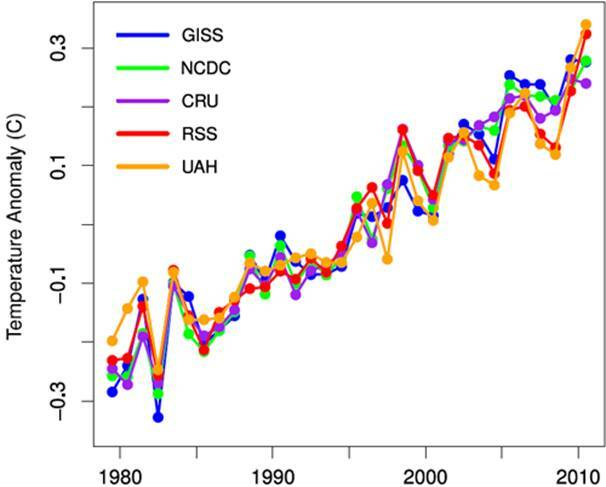 Further to this, the Mail has not done any real analysis of this trend, such as presented in December 2011 by Foster and Rahmstorf (Global temperature evolution 1979–2010, Grant Foster and Stefan Rahmstorf, Environmental Research Letters 6 (2011) 044022 (8pp)). In their paper they correct for the effect of volcanoes, solar variability and ENSO (El Nino Southern Oscillation) in all the main global temperature data sets and present the chart below – which shows a steady and continuing issue with the global heat balance and a consequent rising temperature trend. Other studies show similar findings, such as the Berkley Earth Surface Temperature Project. The Economist also weighed in and discussed the differences between climate modeling approaches and ventured some thoughts on why these models are giving quite different results at the moment. One of the issues that the Mail article addressed was the money being spent in the UK on renewable energy and its flow through to electricity and fuel bills. There is no doubt that this is an issue at the moment in the UK, but the reasons for it are multiple and complex. Attempting to create a simple link between the need for offshore wind subsidies and recent temperature trends trivializes both the climate issue and the various discussions around energy security, competitiveness and energy costs. The renewable energy issue leads onto another story published just before Easter – a posting by Paul Gilding in Australia which made the case that the fossil fuel industry is on the verge of massive disruption, leading to its inevitable extinction in just a few decades. Of course it’s difficult for me to pass credible comment on this, given my affiliation to that industry, but the facts simply don’t stack up. While there is no doubt that renewable energy use is accelerating rapidly, so too is the use of fossil fuels and of course our overall use of energy. Both renewable energy and fossil energy will need to grow, simply to make energy ends meet. In the recently released Shell New Lens Scenarios, the Oceans scenario sees an extraordinary increase in solar energy uptake, which by 2030 is seriously outpacing the recent and current (1990-2020) surge in coal use. But even with this growth rate, it is not until about 2030 that fossil use drops below 80% of primary energy use and not until 2060 that overall fossil use actually starts to decline in absolute terms. Finally, Bjorn Lomborg resurfaces in The Times with his article “The joy of global warming” (subscription required to read this). He argues again as he has for many years that the issue is something for later rather than for now (“ . . . global warming is a problem for the future but a benefit now . . . .”), but does make the cogent point that the emissions issue will not resolve itself until “green” energy comprehensively outcompetes fossil energy. However, he seems to miss the point that climate is a “stock problem” due to the accumulation of CO2 in the atmosphere, so simply waiting until later may not be the right course of action at all (again, another lesson from the recent Shell scenarios). So, as already noted, a bewildering array of messages. It is little wonder that policy makers, the public, academia and NGOs are collectively at a loss as to how to take the climate issue forward. Most readers are probably well versed on my view of what needs to be done, but if not, it’s here. Fortunately, this is a non-problem. As we know burning all proven fossil fuel reserves would take us to 600ppm CO2 concentration which is slightly more than double of 280ppm of pre-industrial concentration. This would give us perhaps 2 degrees increase of global temperature (compared to the year of 1850). Current observations show lower rates of increase over last 150 years so far. Yes, it is likely that mankind can find and burn more fossil fuel (very likely natural gas with low carbon content) but thanks to the logarithmic relationship we would need to burn twice as much carbon to continue global warming at the same pace. So even if we assume that the observed climate warming was caused purely by burning fossil fuel we would have to try hard burning all fossil fuel we can find over next few centuries to increase global temperature by 3 or even 4 degrees C.
Current lull in the global warming confirms that alleged runaway global warming (as predicted by IPCC models) is nonsense. And any ongoing climate change (as being observed) is a non-issue at least over the next century. I don’t have my crystal ball here to predict exactly what happens in the next few centuries but I guess that fossil fuel will become more expensive simply by the fact that easy to produce fossil fuel is consumed first. There is no need to add any artificial carbon trading to this. There is so much uncertainty in these predictions that we can be certain that they will be wrong and public money will be wasted. I certainly understand that it requires significant amount of knowledge and courage to do nothing with a non-problem. But doing nothing won’t give you a super-national stamp on making “green” energy money out of “thin air” alas “carbon scare”. And here was me thinking that you had gone to hassle somebody else. Haven’t heard from you for a while, Jiri. Welcome back. You say that you are interested in the climate science so I’m just trying to help. If you say that you don’t read what I write I stop at once and never come back. I always read what you say, otherwise I wouldn’t comment back. But there seems to be little in common on our views of the science. The value of David’s comments become much more apparent when contrasted with their counter arguments. Jiri’s willingness to play the role of the Washington Generals improves the quality of this blog. Science is the way of investigating things. We can be proponents of various hypotheses but shouldn’t disagree on the way how to conduct the science. Unfortunately, disagreement on the ethics and scientific methods is quite common in the climate science. I don’t think it quite exists in other scientific fields. Maybe not even economics. But, you as a lobbyist are really not expected to be following ethics of science are you? After all I don’t follow it in my posts neither as it is just a blog and not scientific paper or lecture. And I’m not an author of the blog and official but just a commenter. And if I ridicule myself it is just my personal shame and not a shame of a major company. But I do at least post your comments, Jiri, so in that sense I welcome the review of my thinking.